a lovely little life: Upcoming flower project! I'm getting so excited for a wedding that Mandy and I are doing the flowers for in May. We had a conference call with the bride and groom last night (Jeff made fun of us and asked where our headsets were) to go over the inspiration pictures we have for their bouquets and arrangements and bouts and the pictures we took of flowers we saw at the flower mart recently. They are the easiest couple ever to work with, they like everything good and trust our style so it's going to be a fun one. And we're doing succulents!! Photo via Martha Stewart, floral design by JL Designs. We'll use the lambs ears, white hydrangeas, peachy roses, scabiosa pods, and statice as in this lovely arrangement, but also will work in some pink flowers and green succulents to make them a little more colorful. The vessels are thrifted cut glass low serving bowls that we're spray-painting metallic gold from the inside so they're going to look glamorous and awesome. 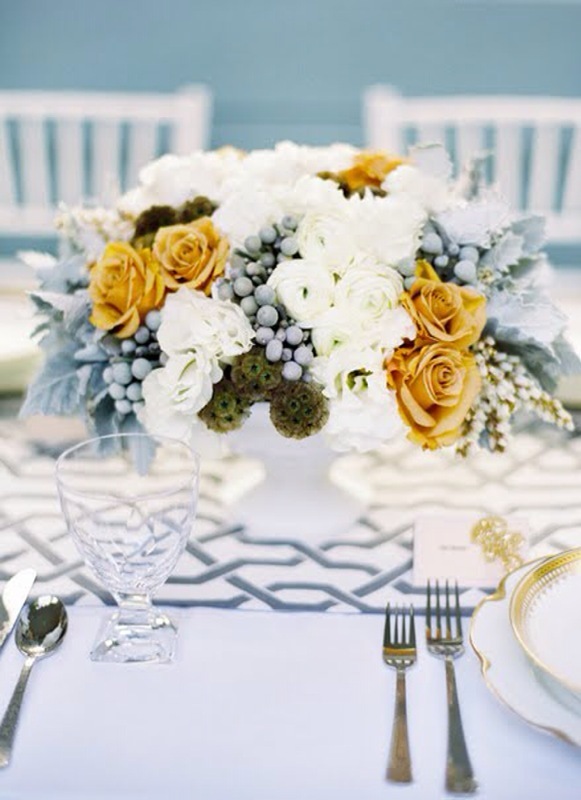 Photo from This Modern Romance, floral design by Penzi Weddings. 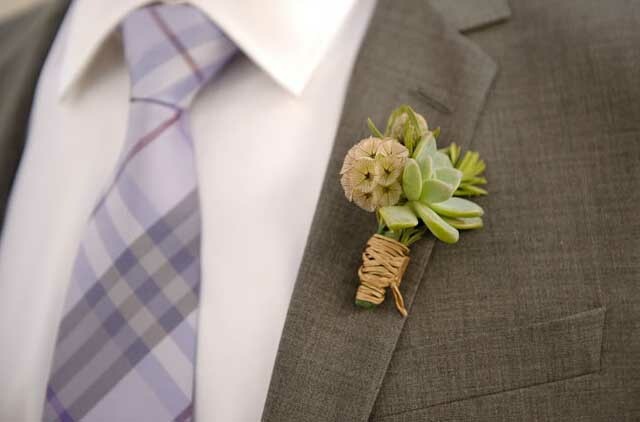 For the bouts, the groom likes the look of this scabiosa pod and succulent rosette wrapped in twine. We're all over anything with a scabiosa pod in it. 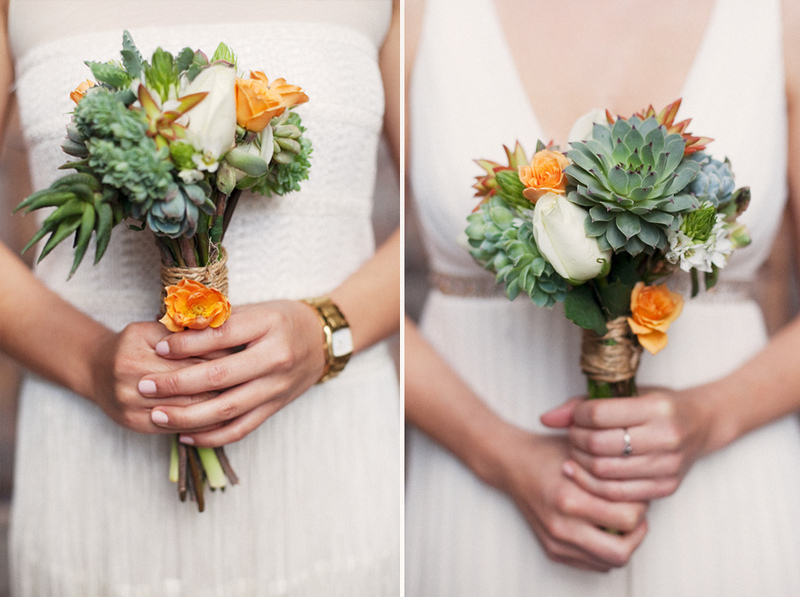 Photo found on La Belle Bride, design by Megan Fickling of La Partie Events, photo by Ryan Jensen Photography. I'll be pretty big by the time of this wedding but luckily we'll have the boys help for hauling everything and it'll be the only bigger wedding we'll be doing before baby time so it's manageable. Can't wait!